I’m confused. Yahoo news is reporting that there is Melamine in infant formula. 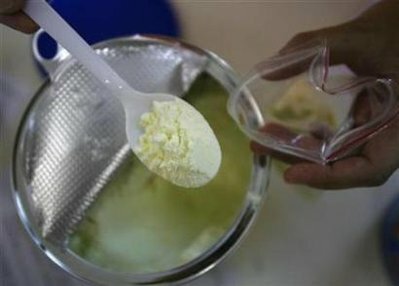 The FDA says that there is no acceptable limit for Melamine in infant formula. The FDA also says that we (parents) shouldn’t overreact. Traces of the industrial chemical melamine have been detected in samples of top-selling U.S. infant formula, but federal regulators insist the products are safe. The Food and Drug Administration said last month it was unable to identify any melamine exposure level as safe for infants, but a top official said it would be a “dangerous overreaction” for parents to stop feeding infant formula to babies who depend on it. Previously undisclosed tests, obtained by The Associated Press under the Freedom of Information Act, show that the FDA has detected melamine in a sample of one popular formula and the presence of , in the formula of a second manufacturer. So what is it? Is a little bit of Melamine okay when it’s not your child? Is it okay if the kidney stones are small? Which scientist/policy maker/corportate giant is going to rock the babies when they pass kidney stones? How much profit is there when you medicate the mothers who are mourning the loss of their children? We were furious when babies died in China, are we only irritated when they’re deliberately poisoned here in the USA? Where is the outrage? This is a failure and an abomination. For those of you who are even considering posting about how babies should ONLY have breastmilk… don’t even think about it. Not today. If you have a baby, or a friend has a baby here are some important facts. Three tests of Nestle’s Good Start Supreme Infant Formula with Iron detected an average of 0.247 parts per million of cyanuric acid, a melamine byproduct. Nestle’s Peptamen Junior medical food showed 0.201 and 0.206 parts per million of melamine while Nestle’s Nutren Junior-Fiber showed 0.16 and 0.184 parts per million. Rep. Rosa DeLauro, D-Conn., who heads a panel that oversees the FDA budget, said the agency was taking a “marketplace first, science last” approach. Wow. And they’re not even forcing Abbot to disclose which particular type of Similac is tainted? Un-freaking-believable. Also, it’s not just Nestle/Goodstart. Also J&J’s Enfamil LIPIL with Iron. OMG… I don’t even know what to say. This is a nightmare and regardless of feelings regarding breast/bottle, many children are formula fed for various reasons and we are being failed by those who we trust to provide safe products for our children. The four month old I take care of is on Good Start because her Mom was unable to breastfeed. Now I am looking at the can on my counter wondering if it’s going to make her sick, or worse. The FDA and formula manufacturers need this cleaned up NOW. It is an emergency not something to sit back and twiddle our thumbs over. Great post Jessica. The FDA seems to have become utterly shameless in their lame attempt to even pretend to be protecting public health. I am soooo excited for a new administration and a real opportunity to push for better policies and better, stronger, appropriately staffed agencies to enact those policies. 2009 is going to be the year of the mamas!! The newest lobbying force to be reckoned with! Jamie, I think I’d ask my pediatrician. I’m afraid to think of the other things the FDA thinks is OK to be on the market. Two batches of My Organic Baby soy-based powder formula had the highest melamine levels (. 334 and .346 ppm). The baby food company is a subsidiary of Vancouver-based alternative beverages group Clearly Canadian. if any of you find a source for SAFE infant formula could you please let me know asap? what organic formula ..stop babelling..if it was found in any than in similac…and they dont disclose witch one of theirs…..nature one guranties no melamine..in their organic formula……nature one does not buy anything from china,…and there is the key…….and nature one is american..and a small company..and only their coconut oil is comming from a latin american source ..believe me ..i called and had paperwork send from all of them nature one was the most forth comming……. Oh gosh, I didn’t realize that there still comments coming in here. I don’t have the answers. I hate that I only have red flags and questions. Can I recommend calling your pediatricians and your senators? I would still suggest trying Nature’s Own. I order it from the US (they don’t sell it in Canada) and there is something about the company that sits well with my mama instincts (which might be the best thing to go on these days). They seem to care about what they are doing. Check out their website and see for yourself. They have done their own testing for melamine and declare themselves untainted. Everything is made in the US. My Organic Baby is the only organic brand of formula you can get in Vancouver. I tried it 6 months ago and it was disgusting. Tasted like rotten fish. Needless to say my baby thought so too. Again, my mamadar immediately thought “this company is just trying to take my money and doesn’t care about the product.” I felt the same way each time I read the 500 item long ingredient list on the mainstream products. One must be careful about the “organic” label these days. It doesn’t always mean what you think. Does Your Furniture Contain Formaldehyde?